You can use spatially or time varying wavelet. This feature allows you to define the different X/Y locations and time for interpolation of wavelet between the different location/time. Combining multiple wavelets in the same wavelet object automatically creates a wavelet field. Insight automatically interpolates and extrapolates wavelet fields to provide a smoothly varying wavelet at any location. In the Details Panel of the wavelet that you want to create location/time varying parameters, click the Add icon at the top right corner. 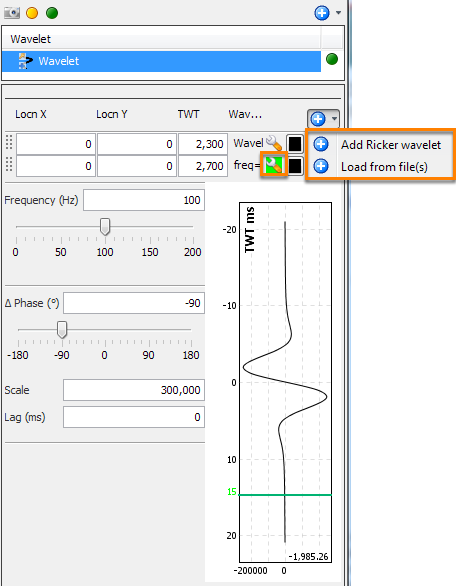 In this example, click Add Ricker wavelet. If you want to load a wavelet from a file, click Load from file and then select the wavelet file in the .su format. At the row of the wavelet which you want to edit, click the Configure this wavelet spanner icon. Under the Locn X, Locn Y and TWT columns, type the X/Y locations and/or TWT to define the X/Y locations and time for the wavelet. Configure the Frequency (Hz), Phase (°), Scale and Lag (ms) for the wavelet. An acceptable value for lag is between -/+1000ms. Go to the subsequent row and repeat steps 3–5 to define the X/Y locations and time for the wavelet. Repeat all the above steps to add more rows and define different X/Y locations and/or TWT to configure wavelet at the specific locations and/or time. Wavelets defined at different X/Y locations are combined horizontally based on inverse-distance weighting. Meanwhile, wavelets that are defined at different TWTs are linearly interpolated to combine them vertically. To configure the wavelet view (see Configuring the Wavelet Preview Window). Tip: The performance of a wavelet field is proportional to the number of TWTs at which you have defined the wavelets. For example, defining wavelets at five different TWTs will require considerably more computation than defining wavelets at five X/Y locations at the same TWT.